*Toughest decision made: Do I crochet some more or let Juliana give me a manicure? *Most thankful moments: Those spent watching my husband build the world's greatest treehouse for a mess of excited children. Particularly the morning we both awoke at 5am, unable to sleep so we got up, had quiet coffee and drew up more detailed plans for the treehouse and headed to Home Depot before anyone was awake. *Most blissful interlude: Getting back in my warm bed in the middle of a cold night after (yet another) bathroom trip, only to snuggle into some seriously flippy and motorboat like motions dancing around in my belly. "Oh, hi", I said. STEPHANIE, come on down! Stephanie of Loft Creations shared a yummy sounding Tomato White Bean Soup and will be soon showing off her cooking skills in a new apron and cleaning up her mess with some lovely dishtowels. Send me an email with your address, to claim your goods! 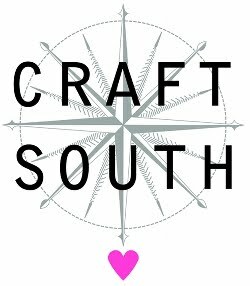 *If you'd like a chance to win Seams To Me or some fabric, Jennifer at Craftsanity, has just posted our 2nd interview podcast, so go leave a comment to enter your chance to win before Dec.15th. Listening to the podcast is not a requirement, 'less of course you just want to. 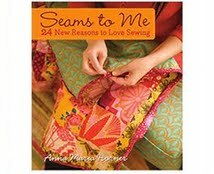 *Also, the fabulous folks at SewMamaSew have offered a chance to win my book as well, so go throw your name in the hat here. I think perhaps they will draw a name Dec. 3rd, so ya might wanna hurry! That was all very linky. Now, LOTS of you are wondering when you will hear about the MOTHER of all giveaways, and I am pretty certain that the winners will be getting contacted starting today. I should make clear that I am not in charge of this giveaway, just a happy and (mostly) innocent bystander, who is just as excited as you to see who's gonna win all this stuff! But I did also get it confirmed that the winners will be posted at the sweepstakes site next week for clarification. Exciting! Photos above: images that I worked on for my new linens (available now) as well as some holiday home goods (rugs, stockings, etc.) that won't be available for another year. Sheesh, that's quite a wait. At least it wasn't too much of a stretch for my model to play with popcorn and cranberries this time of year. We'll be doing that for reals this weekend! I guess I didn't realize you are pregnant - Congratulations! 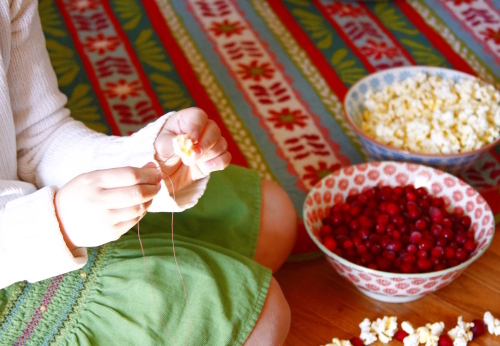 I love the picture of making garland! I plan on having the kids do that also this year because our real Christmas tree need to be outside this year due to dd's allergies. Sounds like a perfect weekend. How exciting you are feeling your little one already! I remember those movements...wondering whether baby will turn out be a soccer player, gymnast, or boxer based on what they were doing in my body! I used to turn on dance music really loud when I was pregnant with Jordan and I swear she would kick me to the beat! Ohhhh I missed the announcment of baby!! Congratulations!! lovely. i'm crossing my fingers for the fabric and wishing you more of those peaceful moments. I'm like the other commenters- is this the first time an announcement was made?? Congratulations!! What a joy and blessing! What!!?? Your pregnant? WOW congratulations! Glad you had fun over the Thanksgiving Holiday! 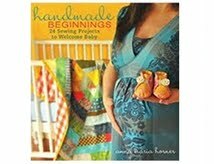 Stop by and enter in my giveaways! Wow I won! I'm going to be so very stylish!!! I hope you love the recipe. And congratulations!!! Congratulations on the little one on the way! I just had #3 8 months ago. I will catch up to you one day! Where did you get that beautiful rug in the first photo? And I need that apron!! Oh hi, I said... I totally missed that post. Congratulations! That sounds like a wonderful weekend. I just love feeling a baby move for the first time. It's such a wonderful and special feeling, isn't it? It's like the best secret you ever had. I am very excited about your new linens and goods. It will be so hard to wait a whole year, but from what I can see, it will be soooo worth it. Lovely post. And lovely fabric you are teasing us with! A year? Too long. And your new kitchen items are great, too. They seem like just the thing once the holiday items are put away and we want a bright way to greet the new year. Gosh that photo is so incredibly pretty! The colors and textures...great shot! Beautiful! I want to make that garland! My little one, Phoebe, is 4 months old this week. She's our third and being with her is such pure joy. In the middle of a busy and overwhelming time right now, she calms me down and centers me every time. When she smiles its like her whole face is cracking open, just bursting. Can't wait to hear more details. Congratulations on your pregnancy! I only have two children...so far...but I believe we will have more. Your large family both inspires and encourages me. 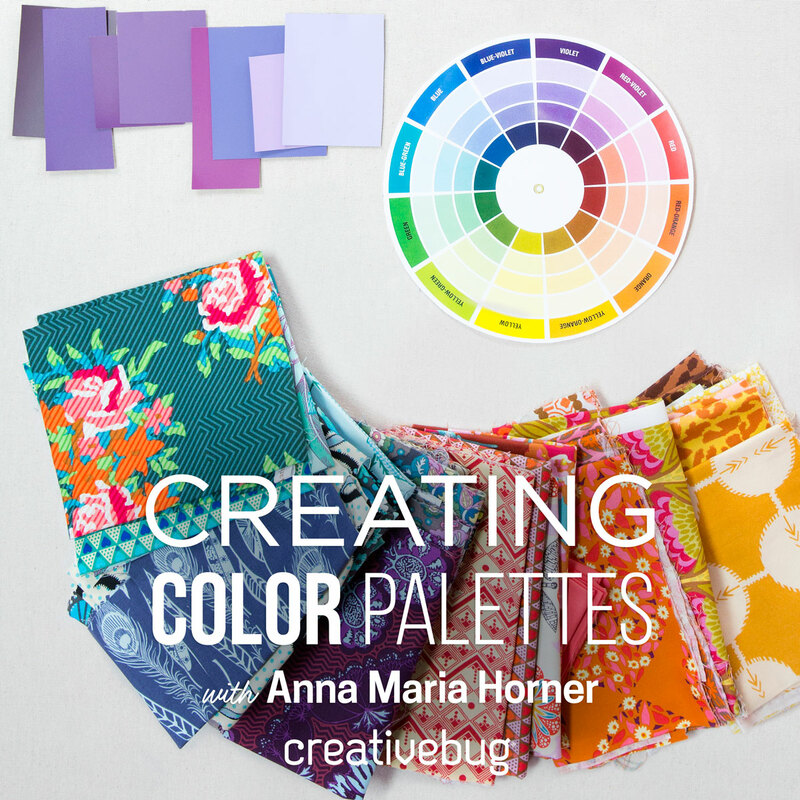 It's so wonderful to see you fulfilling your creative endeavors while balancing family life. I'm delighted about your news! I also LOVE that rug! And congrats on the pregnancy, I hope it's smooth and uneventful. How exciting! 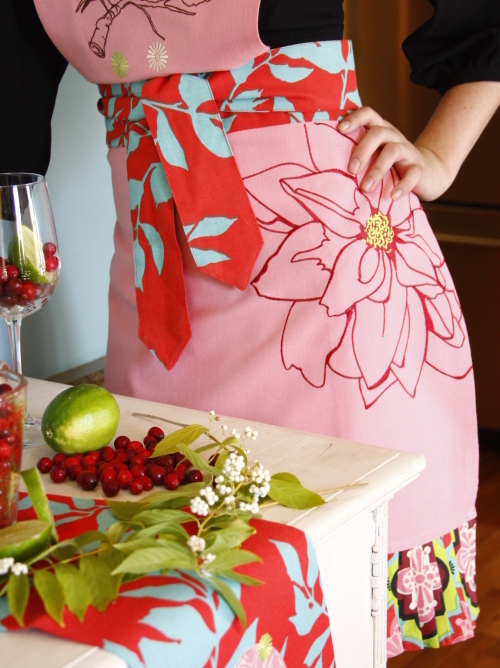 And the apron looks amazing - I love the placement of the flower. Oh the sweetest of posts! Did I miss your post about being pregnant or is this your way of surprising us?? Gorgeous! Your blog never fails me! I just adore your style, thank you for posting. I am looking forward to listening to your new Craft Sanity interview, because I enjoyed the first one very much. WHAT! I check your blog every day and I don't remember any announcement! I can't believe I missed that one. Congratulations! I have 3 between the ages of 3yrs. and 4 months...I've got the bug already! So very excited for you and your family! I don't think that apron could be ANY cuter! Oh....congrats! That is wonderful, another little one. I love your blog and your fabrics. After I saw your fabrics, I realized that I had to learn how to sew, so I got a sewing machine as a gift from my husband and have been busy doing little things for around the house but I'm having such a hard time finding your fabrics. I am in Vancouver, BC and I have called around EVERYWHERE and so this weekend, I'm thinking of going down to Seattle to find some :) So thank you for being such an inspiration. This has to be either my biggest brain fart EVER to have missed news that you're pregnant, OR it's the sneakiest dang announcement of ALL TIME!! The apron is just too cute!! Take care of yourself and the little one!! WHAAAAAAAAT?? You're pregnant?! Holy crap! December Views led me to your beautiful blog! Thank you for so many tutorials and EYE CANDY! Gotta go get your book now! I love that red and blue print... I might need to purchase that and Hubby is already upset with me for fabric purchases of late. Yay for more babies! Congratulations!!! Is the apron tie a red/blue version of Branching Out? It's absolutely gorgeous and I would love to know if it's available to the public. Please!! Congratulations on the healthy progress of number 6! Sounds like some wonderful moments from Thanksgiving weekend to cherish. I wish I could bottle that feeling, when you have to decide which of your favorite things to do first. I am loving your new kitchen linens! Can't wait to try them out. Oh there is still hope of winning! Woohoo! Sounds like a lovely, lovely time :-) I too, have the flippy motorboat going on :-) Little belly-quakes are so fun! I only recently discovered your blog and I have been devouring the archives with much enthusiasm. All the color and coziness is enchanting. Congrats on #6 from a very new fan! i immediately fell in love with your gorgeous apron that i just had to have one of my own! :) i ordered mine today, and can't wait to bake christmas cookies with it! to keep them for myself. Sketchbook will always be my favorite! Thanks and take care of yourself! !